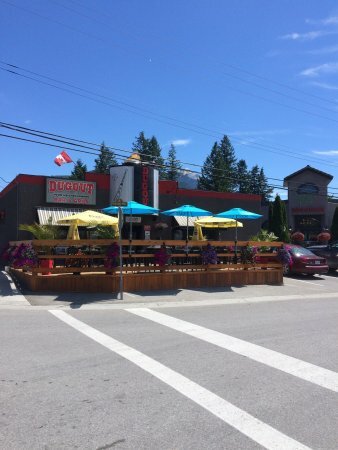 There aren't enough food, service, value or atmosphere ratings for Dugout Bar & Grill, Canada yet. Be one of the first to write a review! Good cheap wings on wing night! Poutine is great too! lots of flavours to choose from. Typical local pub feel with lots of locals. We had a shocking meal here - chicken curry that was just ....not sure of the words to describe it. And the ceaser salad was a jocke. Two beers, one wine and the above for $40 - would have preferred to not eat. We were looking for a decent meal in a character pub. Well the food was bland and over done. The ambiance was ear shattering.I guess that might be called character by some. Don't rush to this below average pub. This place came along great. New owner, great food, great service, good times! Really nice patio when the weather is permitting you will find a fire pit. Nice spot! NIce pub with very large meals. Friendly staff. I defiantly would eat here again on my next visit to Golden. Get quick answers from Dugout Bar & Grill staff and past visitors.